Patched conics are a useful approximation when dealing with orbits that are under the influence of multiple planets or moons. The idea is that only one planet’s or moon’s gravitational field is active at any one time. For example, at the start of a mission from Earth orbit to the Moon, we assume that only the Earth’s gravity acts on the spacecraft. For each planet or moon we define a sphere of influence where that body’s gravity is greater than all other sources. In the Earth/Moon system the Moon’s sphere of influence extends to about 66,000 km from the moon. A new function in the Spacecraft Control Toolbox Release 2015.1 is PatchedConicPlanner.m. It allows you to explore trajectories in a two-body system. 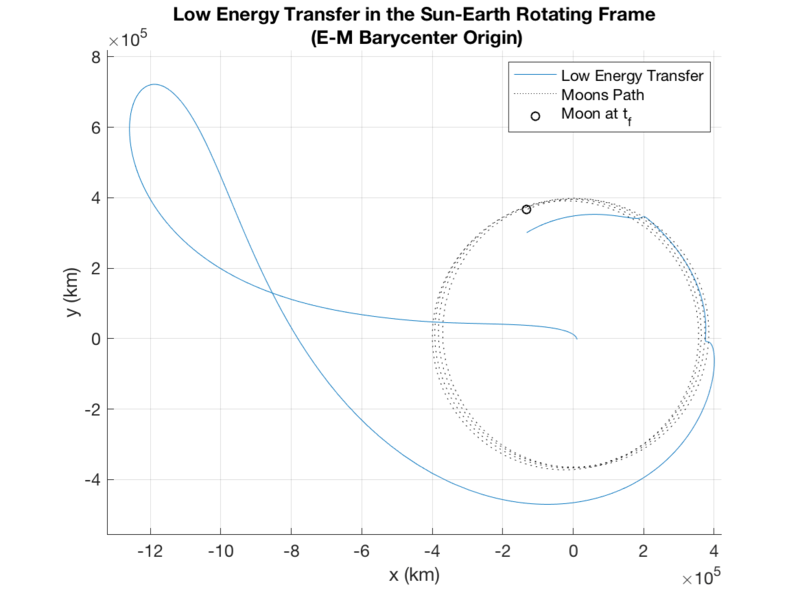 The following figure shows the trajectory of the spacecraft and the orbit of the Moon in the Earth-centered frame. The trajectories assume that the spacecraft is only under the influence of the Earth. The spacecraft is in an elliptical orbit designed to have its apogee just behind the Moon. The next figure shows the spacecraft in the Moon centered frame. The blue line is the trajectory of the spacecraft assuming that the Moon was not there. 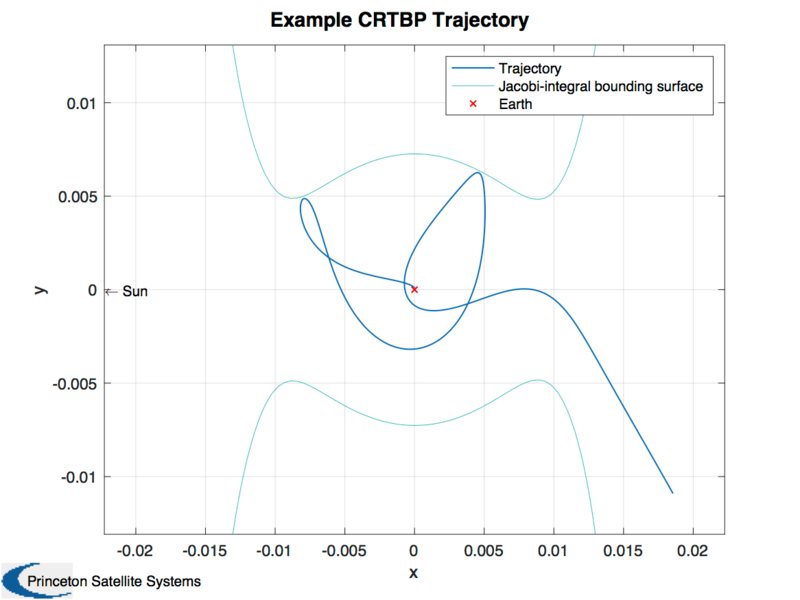 The green line is the hyperbolic trajectory of the spacecraft starting from the patch point computed assuming the Earth’s gravity had no influence on the trajectory. Notice the sharp turn due to the Moon’s gravity. The function returns the Moon-centered orbital elements along with other useful quantities. The following shows a closeup of the trajectory. The miss distance, as expected, is less for the hyperbolic trajectory. The plot clearly shows a good place for a delta-v maneuver to put the spacecraft into lunar orbit. 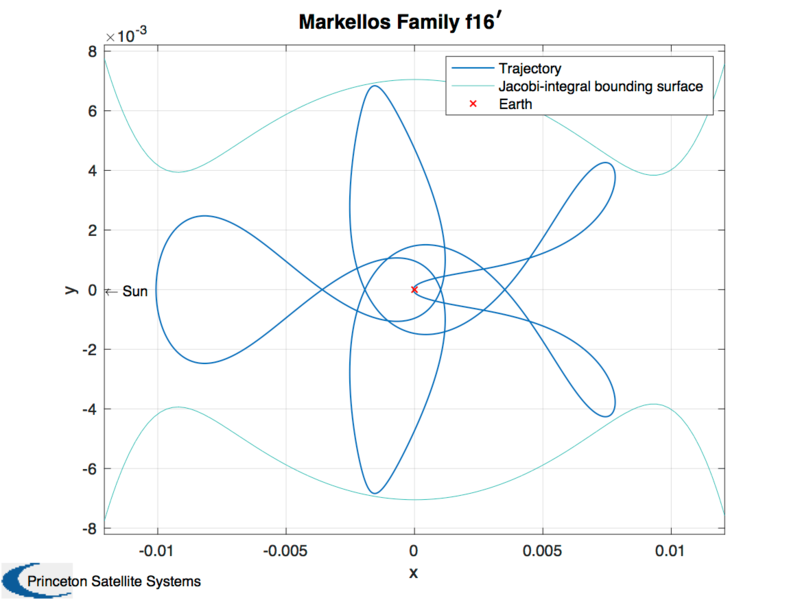 This function allows you quickly explore the effect of different patch points and to try different spacecraft transfer orbits. While a “high-fidelity” analysis requires numerical orbit propagation that includes the Moon, Sun and Earth’s gravitational fields, PatchedConicPlanner.m, let’s you generate good starting trajectories for mission planning. Space is silent. No air, no sound. This must have seemed strange on February 10, 2009, when the satellites “Kosmos-2251” and “Iridium 33” collided, shattering the spacecraft into more than 2,000 pieces of debris. Now, each of these pieces presents a new risk of collision to our satellites in low Earth orbit. An example collision avoidance scenario between two close-orbiting satellites. The potential to collide with other satellites or debris is a real and growing concern. As a result, collision detection and avoidance are becoming a critical aspect of satellite operations. We have worked on new collision avoidance algorithms and strategies for several different projects, including the Prisma formation flying mission which was launched in 2010.